Efes is the number one selling lager in Turkey and is exported to more than 40 countries around the world including the United Kingdom, Germany, USA and Japan. Efes Pilsener has become synonymous with beer in Turkey with nearly 80% share of the domestic market. It is brewed by bottom-fermentation technique with pils type of Golden barleys, high quality malt and 'Hallertau' hop. 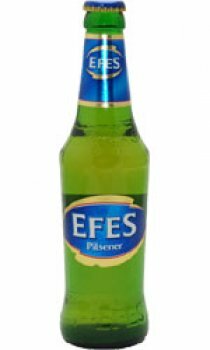 Efes is an easy-to-drink, foamy, bright lager beer with 5% alcohol content. Hi, have just received 12 bottles of Efes from TheDrinkShop well packed in a very strong box, arrived quickly, ace trader. I am also a cider drinker, Blackthorn mainly, not Strongbow as it smells and tastes unpleasant. Nothing better than bottle of Efes on Suara Beach (olu deniz) life does not get better. Try it on a really hot day, and not in a glass, straight from the bottle. Enjoy. I don't normally drink lager, being a cider quaffer as a general rule but as Turkey doesn't seem to sell an awful lot of cider I was forced to resort to the local brew. And it was absolutely no hardship. Efes is a lovely lager - light, crisp and very very refreshing. If you're used to the bland, gassy continental lagers (Carlsberg, Carling et al) then give this a whirl. Perfect for the upcoming summer barbecue season. Providing we get the weather this year...!